Ilinois high school senior David Clark will have to think twice, though he’s worn the shirt before, without incident. But not this time. So what did it say? “I [heart] My Wiener” with a picture of a dachsund under it. 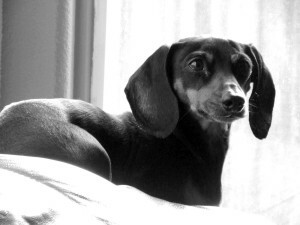 See, David’s dachsund was hit by a car and killed a few months back. The shirt is David’s way of honoring his dog. students from wearing any clothing that is disrupting to the educational process, interferes with the maintenance of a positive teaching and learning climate or compromises reasonable standards of health, safety and decency. Right on, Clarks. Principal Choate, lighten up.